Insurance Internet Marketing Tips and Tricks! Insurance internet marketing is a requirement if you want to survive and thrive in the coming years. Sure, there are agents selling insurance using offline media, but online insurance marketing is a wide open market because most people are using their computers or cell phones to access information and to buy things they would normally walk or drive down the street to get. People still use the print version of the Yellow Pages (the big yellow book in your cupboard), but it's use is decreasing year after year (you should advertise in the Yellow Pages because you will get highly qualified leads if you advertise properly. And you can get an online marketing package with the Yellow Pages which makes it very useful). If you are not familiar with insurance internet marketing, then selling insurance online can be challenging at first. But the learning curve is short when it comes to the basics. And it's the basics that will keep the insurance leads flowing. Get targeted traffic to a lead generation website. Turn that traffic into interested prospects. Close them on your insurance products. So how do you get traffic direct to your lead generation website? Organic traffic occurs when your web pages rank high in the search engines for popular (and not so popular) search terms. As a result people find you easier and you get highly qualified free traffic. This is the best kind of traffic. The bad news is that it will be nearly impossible to rank high for competitive search terms in the insurance arena. For example, if you want your website (or a page on your site) to rank high for the search term 'life insurance', you will have to spend months if not years on online insurance marketing which includes getting other highly ranked sites to link to your 'life insurance' website or page. The good news is that it's very easy to rank high for LOCAL search phrases because most agents don't understand insurance internet marketing, and are busy doing other things like cold calling. These keywords are just ideas off the top of my head. The list is endless. The hard part is finding out exactly what people are searching for in your area. Some phrases you can uncover using keyword tools like Googles free keyword tool, but it's not perfect. You'll have to use tracking software to find out exactly what people typed into the search engines to find you or you can use software that will tell you what your competitors most common search terms are. Recommended Videos: These annuity lead generation article will show you in detail these tips and much more. 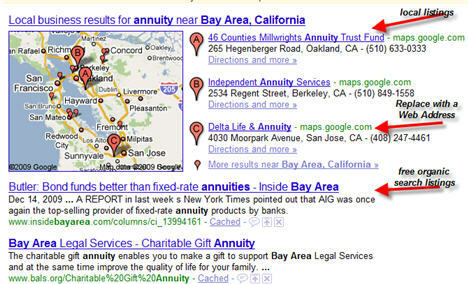 The first insurance internet marketing you should do is to make sure you are listed on Google Local Business Center. And make sure all of your information is up to date including pictures, services, products, video etc. Go to the Google Local Business center and follow the instructions. You'll get free traffic this way because the local listings get the best real estate on Googles search page when someone does a local search. It's Free! Next, use a software program like Statcounter (free version to start) and put it on your website. This way you can find out exactly what people typed into the search engines to find you. It's a very powerful insurance internet marketing technique. And after you find out what people used to type into the search engines you can create pages around each individual phrase to boost your rankings for those terms and therefore get even more free local traffic. Next, use pay per click advertising. Go to Google Adwords and open an account. Then follow the instructions to create a local advertising campaign. These are the basics of insurance internet marketing and they will take you a long way. Just be sure you take your time particularly when using Google Adwords. If you make a small mistake in your keyword, geographic targeting, and advertising budget, you might discover a big bill for the day or the month. The only insurance internet marketing technique we did not discus, and is vitally important is your website landing page (the page people first see when they click over to your website). This is also very important because you want to convert a large portion of your traffic into interested prospects. The key is to focus on getting the lead. I know, it sounds complicated. But it's not really once you start digging a little bit. It's actually a lot of fun. Online Insurance Lead Company Reviews: Let These Insurance Internet Marketing Companies Generate Qualified Insurance Leads For You. Copyright Insurance Leads Advisor All Rights Reserved.